*I've been reliably informed that not all volcanoes are conical. In fact it is only cinder cone volcanoes that have this shape. Shield, Dome and Composite volcanoes have different shapes to reflect the different processes of how they are formed. It's a similar shape to piles of sand, piles of grain, and sand dunes. If you pour salt onto a table, or look at at hour glass running out, you see the same shape. What's going on? It's a combination of gravity and friction. The grains of sand, rock or ash are pulled down by gravity; they want to flow down-hill. They are, however, also gripped by the other particles already on the slope. This gripping is called friction. Sharp, rough or sticky substances have more friction and this grip force is strong. Smooth or slippery substances are gripped less. As you can see from the diagram above there is a relationship between the angle of the slope the coefficient of friction. When a particle is dropped onto a slope, if the angle is below a critical angle, it will stay put. If the angle is steeper than a critical angle (defined by the inverse tangent of the coefficient of friction), then it cannot grip and slides down the slope. It is this behaviour (applied rotationally symmetrically) over the pile that creates the cone shape, and the steepness of the cone is proportional to the coefficient of friction. The study of friction and the relationship between surfaces moving relative to each other is called Tribology. If you look around, you'll find many examples of the phenomenon. Here are some sample materials and their angles of repose. Fans of Star Wars* will know that the same forces can be applied to an inverted version of the shape. 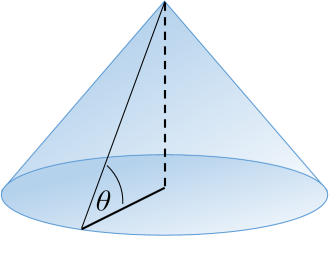 Rather the defining a conical protrusion, the same physics principles can define a conical depression, the slope of which is at the same critical angle. Maybe you've experienced this as a child when digging a hole at the beach? As you dig deeper you find that you have to make the diameter of the hole increasingly larger as the sides of the hole continue to collapse. There is a critical angle (which we now know is the Angle of Repose), after which, the walls are no longer able to support the particles and they slide inwards. Wet sand has a higher coefficient of friction than dry sand, so it is possible to dig steeper sided holes in the wet. There are some clever animals that use this principle to their advantage to catch pray. On of these is the antlion. The antlion larva creates a conical depression in dry sand, and hides at the bottom. The angle of the sides of the depression are at the angle of repose. 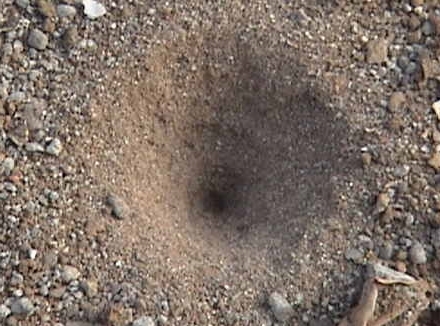 An unsuspecting walking insect, such as an ant, when it encounters the slope will slide down into the bottom of the pit; not being able to gain traction to pull itself out, as each attempt to climb up the slope loosens particles the are critically balanced and sends all sliding down to the bottom of the pit and into the waiting jaws of the antlion. — C-3PO's translation of Jabba the Hutt's words to Han Solo, Luke Skywalker, and Chewbacca.